More armored tanks has been deployed to Marawi City to support the ongoing firefight between the government forces and Maute group on Thursday. At least 20 army tanks rolled to Marawi City on Thursday to support the military forces fighting the Maute group in Mindanao. 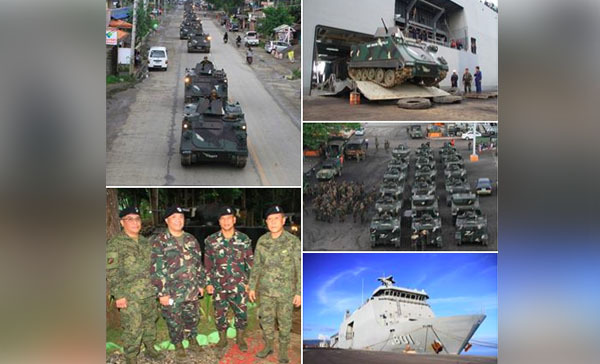 In addition, 400 members of 7th Marine Battalion was sent to reinforce troops who have been battling the reportedly ‘increasing number’ of Maute group. Meanwhile, the government’s deadline to take back Marawi was this week, but officials said that they will not meet the estimated time. Reports said that the Maute members are growing in numbers. Death toll from the siege reaches 175 including civilians, enemies and military forces.